Misty primeval forests, laden with Spanish moss, heavy with kudzu; a child’s slide, long-ago abandoned and rusted with age; a shuttered house, kudzu-wrapped and half-obscured; an unmanned ticket booth; a dirt road that leads to nowhere, and to anywhere. This is Walker Pickering’s Southern Kingdom. Photographing throughout the deep South, primarily in Alabama and Mississippi, Pickering went searching for a true sense of place, something “real” that he felt was missing in the small Texas town of Orange where he spent most of his childhood. That small town, right on the border with Louisiana, was unlike the rest of Texas, and yet not quite Southern. To Pickering, Orange seemed that it was neither here nor there, but stuck somewhere in-between. That longing for a sense of place and authenticity was formed during Pickering’s childhood summers. He and his parents drove, from Texas, to Hattiesburg and to Mobile, to gather with the extended Pickering family. These were the areas where much of his family lived in the mid-20th century, before he was born. This larger family history offered Pickering a strong connection to his own past, and to that of his surroundings. As a child, he felt drawn to these “beautiful and deeply troubling” places, more than to any of the other surrounding states, more than to his own hometown. With an adult perspective and insight, Pickering returned to some of these same areas, over a number of years. What he offers is a moving and clear-eyed view of small town South that unflinchingly documents the present while evoking the past. The color of the light—soft, lovely and uniform throughout—reveals a beauty that is natural to these enigmatic scenes. The color palette, and the way the light plays on that color, is so much a part of these images, that it alone carries its own story with a nod to the past. Looking through these images, one by one, is like sifting through old family photographs, at once familiar and foreign, color-faded and luminous. Pickering offers a straightforward and seemingly unbiased view of the places he knows from years of visits, and to which he maintains a strong connection. The time of day he chooses to photograph creates a soft color palette and a quiet mood, both of which add a certain grace and tenderness. Those deliberate choices, and—more importantly—his series’ title, Southern Kingdom, offer powerful clues to Pickering’s Southern sensibilities. The very idea of a kingdom serves to both elevate and isolate. It is a realm unto itself, with obvious spiritual overtones. All of Pickering’s images appear compositionally powerful and uncluttered. His image titles, too, remain simple and descriptive. In the photograph, “Bulb,” the odd perspective of a bare lightbulb against a peeling Crayola-colored bead-board ceiling, white light streaming in from an unseen window, is, in itself, a thing of beauty. 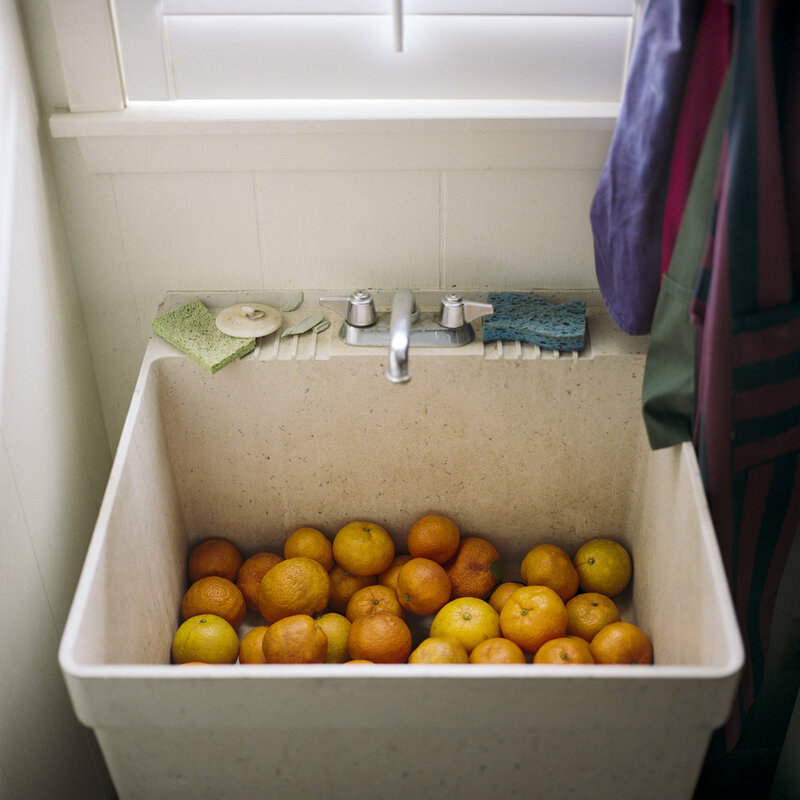 In “Orange Sink,” light falls on a dirty laundry sink, filled only with bright oranges, at once mysterious and inviting. “Bethel Presbyterian” reveals a white chapel interior, devoid of parishioners, but pristine and appealing with its pure light, soft colors, and perfect symmetry. To look at some of these images, individually, is to want to be there, in those same places, at that same time of day. Viewed altogether, however, the serenity of these photographs works as a foil to a deeper message—a collapse of what once was. In “Bank of Yazoo City,” the thin black telephone lines, sloped against a teal blue sky, points the way to an empty bank building, its faded signage all but disappeared, its windows plywood-boarded. “Camper” is just that—an old camper, propped up with rusty steel jacks and set on toppling cinder blocks, where it sits incongruously next to a derelict brick building on a desolate street. “Ticket Booth” offers a picture within a picture—an unmanned ticket booth and, reflected through its glass, the empty town streets. We do not see the families who live here, nor do we hear their voices. However, through him images, Pickering tells a story of the evolution of once-thriving towns and the people who have lived through those changes. Devoid of people, the haunting juxtaposition of both the presence and absence of life remains at the core of Pickering’s images. Although the photographs were made in different areas in the deep South, they could easily emanate from the same small town. That archetypal town, the once viewed absent-mindedly through the window of a moving car, always on the way to someplace else, feels like a town worth fleeting. Pickering invites viewers to stop and linger. Southern Kingdom draws us in and silently encourages us to imagine the everyday lives of those not pictured, the ones who never met Pickering’s gaze. In so doing, we begin to appreciate this poignant landscape and the generations who have inhabited it. Diana H. Bloomfield is a photographer, independent curator, and writer. She lives and works in Raleigh, North Carolina.